How Much Does A Bathroom Remodel Cost?How Much Does A Bathroom Remodel Cost? How much does a bathroom remodel cost? The most common question asked by our customers and it shouldn't be the one thing holding you back from your dream bathroom. Weather your thinking of just updating or a complete remodel, let On The Level Contracting help turn your bathroom into your favorite room. Our team of professionals will assure you that your design, budget and timeline are realistic, and it will give you a goal with a path to get there. Hiring a designer saves you time and money in the long run, so you don’t make expensive errors. Updating the vanity is one of the best ways to improve the look of your bathroom since it is one of the most noticeable aspects of the room (floors are the other one!). There are a wide variety of styles to choose from, so you will have no problem finding one to match your taste. 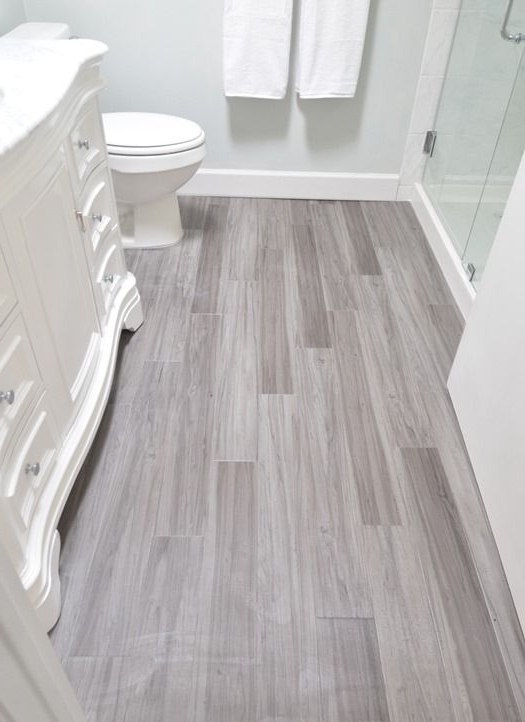 Upgrading the flooring is another guaranteed way to improve the bathrooms. To really add a pop of style, the tile you select for the flooring can be used as a back-splash in the shower as well.Here at On The Level Contracting we use only high quality materials and products for our remodel projects, ensuring you will enjoy the finished space for years to come. Another aspect of bathroom remodels is to upgrade your water fixtures. This can include the sink and faucet, bathtub and shower. The main factor in determining what fixtures can be added will be the size of your bathroom. The brands we work with have bathtubs in a variety of sizes, styles and materials, from claw foot tubs to those made of acrylic or porcelain. 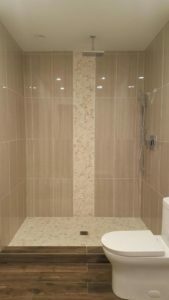 Depending of your preference, our experts can install a separate shower stall. The toilet itself can be upgraded too! Some options include a more attractive looking one or one that is taller or has a more efficient flush system. For many homeowners, the existing floor-plan simply doesn’t have enough bathrooms. In these cases, we can transform a half bath into a full bath or create an entirely new bathroom. The most important factor for these projects is making sure you have enough space. We have created new bathrooms in attics and basements for our customers as well as transformed hall bathrooms, created private master baths and shared bathrooms between two rooms. Worried about the cost of you bathroom remodel? Have you even set a budget, or not sure what a realistic budget should be? On The Level Contracting experienced team, can help you set a realistic budget for you new bathroom with ease. Don’t wait to get started on your bathroom remodel! Our experts will be happy to help you with every phase of the process. Our licensed experts have years of experience working within customer’s budgets, so call us today to learn more about our pricing and to schedule a in-home free estimate! Remodeling a bathroom in your home is one of the best ways to increase the value of your home while also allowing you to create an inviting space that you can enjoy. Whether you are looking to sell your home now or in the future, bathrooms are of utmost importance to potential buyers. Having beautiful, updated bathrooms can make a big difference between selling quickly and your home sitting on the market. All our contractors have extensive experience and are licensed in their trade, bonded and fully insured. If you are thinking about upgrading the bathrooms in your home, give our experts at On The Level Contracting a call for a Free estimate.